I hesitated before accepting the invitation to review this volume. That hesitation was not prompted by uncertainty regarding whether I was qualified to review the subject matter implied by the book's title. Nor was it because I was unfamiliar with, or uninterested in, this subject matter. In fact, my hesitation was prompted by what could be described as the exact opposite of these last points. I am not only extremely interested in this subject area, but also in this particular book. This interest is general, in that university creative writing is the discipline area in which I research and publish. It is also particular, in that I am professionally familiar with the work of the editors and many of the contributing authors. I know these editors and a number of the contributing academics personally. I am also familiar with the work of the publishing house, and have a professional connection with a journal from this publisher. The possible conflict of interest implicit in this situation was the source of my initial uncertainty regarding whether I was the best reviewer for this book. Thinking this through before I replied to the invitation, I could identify two interlinked notions at work. The first was prompted by the idea that all reviews are a form of peer review, with the most valued of these the double-blind review, where neither the author being reviewed nor the reviewers are aware of each others' identities. The second is the associated idea that all reviews - whether of a book, movie, concert or restaurant - are, at their best, objective appraisals of artefacts or events. In this case, both of these factors would presume that the best review of this, or any, book would comprise a detached and impartial assessment that is uninfluenced by the bias that cannot help but attend a personal knowledge of the authors. Many have, of course, recognized the impossibility of any kind of perfect objectivity. We know that human beings are subjective, driven by our beliefs, desires, hopes, observations and motivations. Within this, the book reviewer can at best, I believe, aspire to begin from a position of neutrality, and then, as I have here, acknowledge any possible influences on his or her judgments. Despite attempting to begin from a neutral position - with no pre-existing personal enmities or disciplinary axes to grind for instance - I do not see how anyone can maintain a position of neutrality while actively engaged in the act of reading. Especially if a book reviewer is someone knowledgeable and - as I am - passionate about the subject of the book, there is no hope that a position of detached neutrality can be sustained. There is, however, another meaning of the word 'review': that of reconsideration. This implies that a review can be a re-examination or re-assessment, in effect a re-view of an artefact or event, after that artefact or event has been completed. It was in this engaged spirit that I read this book, and offer the comments below. In the first chapter, the editors define the scope of the book as a focus on creative writing as a subject in universities, with the contents of the book arranged around the three organising sub-themes of practice, research and pedagogy. This introductory chapter states that, in this case, 'creative writing' refers to that which is undertaken and taught in English, making the point, however, that creative writing is also occurring in, and around, universities throughout Europe, Asia and Africa. This collection makes a truly international contribution to the field, with the co-editors based in Australia and UK, and five contributors from each of Australia, UK and the USA. These fifteen are represented by six female and nine male contributors, who range from senior academics to doctoral students in the discipline. Given that the two editors both have Australian connections, I missed any representation of our Australasian neighbours, New Zealand, and note that only one article, that by Stephanie Vanderslice, provides a comparison of the different approaches internationally - focusing on teaching creative writing in the USA and UK. Although, again, I would have liked to see a broader comparison including Australia (and New Zealand), I do acknowledge that no such compilation can ever include everything that every reader can suggest could have made a contribution. The book that the editors have compiled comprises a series of discrete, loosely linked, articles that have one thing in common. They all feed into ongoing discussions regarding a number of issues that have been of concern within the discipline for some time. 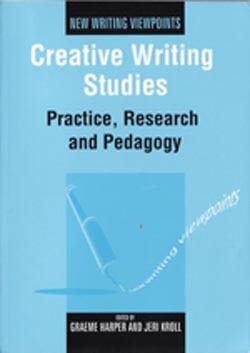 These include how to nurture a critical or theoretical understanding of creative writing as a discipline; how to develop both successful teaching methods and practice-led research in the discipline; and how creative writers who are also teachers and/or postgraduate students can manage the competing, and sometimes irreconcilable, demands of these roles (xii). As material on these issues has been published in articles here in TEXT as well as other international fora, I read through the chapters with real attention as to how the various authors would add to these discussions. I did find new perspectives, ideas and proposals presented, and suggest this alone makes the book worth reading. Another element of real interest in such a collection is the editorial arrangement of the series of pieces and the way this highlights common themes and interests. To me, the various linkages, synergies and (at times) disagreements across the chapters in this collection most closely approach the kind of engaged information exchange that happens at conferences about creative writing in the academy, where everyone's discrete work is nevertheless cognate and interrelated due to shared concerns. This collection reveals its authors' shared passion for university-based creative writing. This is clear in a consistent display of real concern for improving the quality of undergraduate and postgraduate student learning and the quality of the classroom experience for these students. It is clear in the respect expressed for the quality of the writing that results from the university experience for students, postgraduate candidates and their teachers/supervisors. Not least, it is communicated in the regard, and often open affection, with which teachers and students write about each other. This is not always the case in publications dealing with educational subjects, and is - I believe - a hallmark of the creative arts disciplines in the contemporary academy. In this way, Jake Adam York and Kevin Brophy both write about teaching poetry. York shares his use of new media software to alert his students to the material dimension of language, while Brophy utilises the frame of the poetry workshops he runs and the poems therein discussed to discuss the balancing of emotion and intellect in the creation of a work of art. Also focusing on personal pedagogical approaches, Nat Hardy presents how a workshop approach that borrows from Bahktinian formalism and gonzo-journalism can assist non-traditional students, and Gregory Fraser discusses the teaching of theory in the writing class. Jen Webb contextualises her teaching of collaborative creative practice within a valuable survey of theoretical and practical literature on this topic. Discussing where the professional intersects with the personal, Aileen La Tourette ruminates upon the effect of teaching creative writing on her own creative work. Nigel McLoughlin posits how the integration of approaches that he summarises as 'poesis, praxis, process and pedagogy' inform his own research and teaching methodologies, while Rob Mimpriss focuses on a discussion of the short story - a personal research interest - and how various authors have felt they had to offer apologies for working within this form. Both Nessa Mahoney and Inez Baranay reflect upon their experiences as doctoral candidates and writers, and how these roles, as well as the writing therein produced in these roles, can influence each other. Also writing about doctoral level study, Nigel Krauth questions institutional process and cost benefit analyses in his discussion of the doctoral novel and the innovative work his students have produced within this degree. The collection is thus rich in anecdotal and reflective evidence but, as a vocal lobbyist for the discipline, I would also have liked to see some inclusion of empirical, statistical, quantitative (as well as methodologically-based qualitative) research backing some of the more personal claims and assertions. If creative writing research wants to claim a place in the academy that can be understood as equivalent to other disciplines, it seems to me that it needs to engage in, and promote, significant research studies that can be judged alongside the work of other scholars working in such modes in the higher education area. The theme of practice-based research as a whole is more muted than that of teaching and writing through this collection, suggesting the significant work in which the creative arts as a whole needs to engage to tease out the definitions, processes and ramifications of practice-based research in the academy. Missing for me in this collection was any substantial recognition of how creative writing as a university disciplines works to achieve - and sometimes does not achieve - viable levels of engagement with both the general community as well as what we call 'industry and the professions'. How such community and professional interaction influences, informs and enriches university practice is, I believe, an integral part of the contemporary academic agenda and one which was only briefly touched upon in this collection. I recognise this is a particular interest of mine, and that this is not to suggest that what has been included is not worthy or interesting in itself. As creative writing, like most other creative arts disciplines, works towards that full acceptance in the academic context, books such as this are important steps in assuring that acceptance is gained. Besides the stimulation this book offers to those interested in its subject matter, this is another point of commendation for this volume. As a passionate, engaged reader on this subject, I sincerely recommend this book to you and your university libraries. Donna Lee Brien is Associate Professor of Creative Industries and Head of the School of Arts and Creative Enterprise at Central Queensland University in Rockhampton, Queensland.